The circular wooden nursery table has been specially designed for pre-schools, playgroups, nurseries and primary schools. 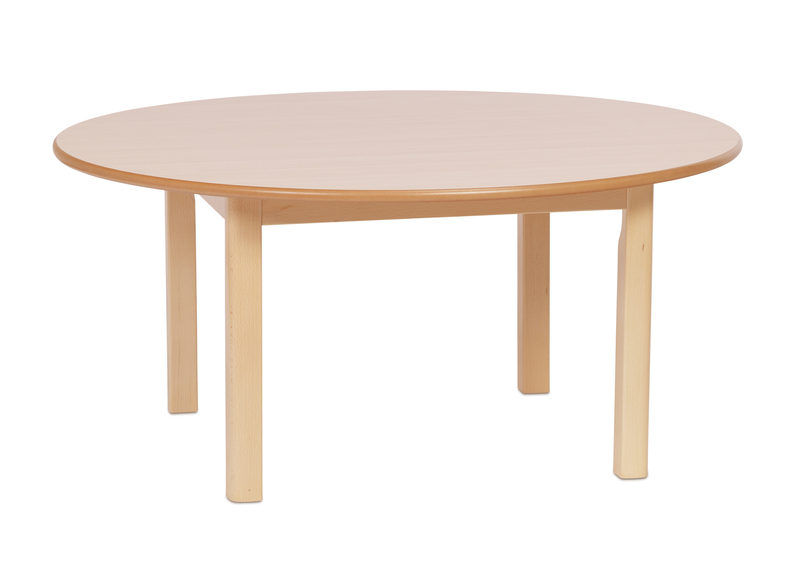 Designed to last, these circular nursery tables are manufactured from solid beech and finished with a hygienic, easy-clean, hard-wearing melamine top. This makes them ideal for mealtimes and messy play. Circular nursery tables have a 1000mm diameter and come in a choice of 4 heights, specifically designed for early years and suitable for ages 0-6 years. If you are unsure of which sizes are best suited to specific age groups, please see our ELF Tables and Chairs Size Guide. The natural finish to these tables provides a modern look to any early years setting. All tables come complete with rounded corners for improved safety. Delivered part-assembled for quick and easy assembly. Simply secure the table legs to the table top using the allen key supplied. This range of wooden nursery tables fully conform to BSEN71 and a EC declaration of conformity is available upon request.